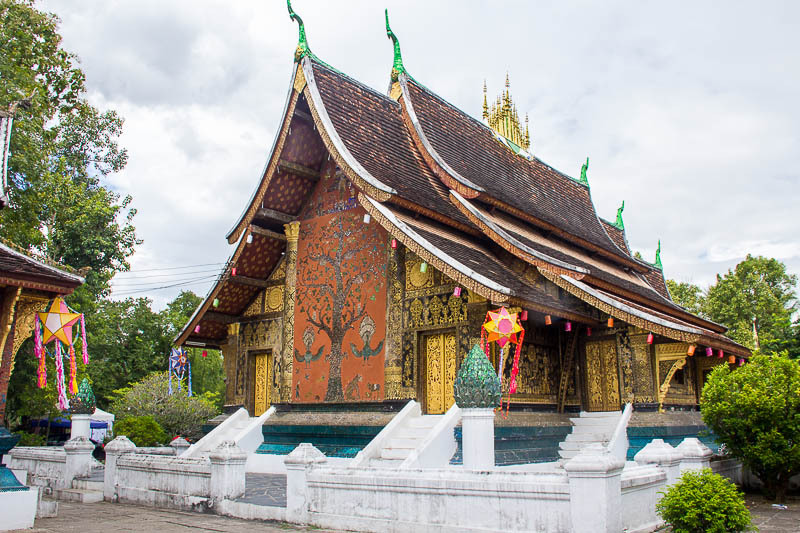 Some of the places are located in the town of Luang Prabang and some are outside of LP. I will include information about location, the cost involved and opening hour (if any). Here you go. The Royal Palace was built in 1904 for King Sisavangvong. In 1975, the communist took over the palace and sent the royal family to re-education camps. 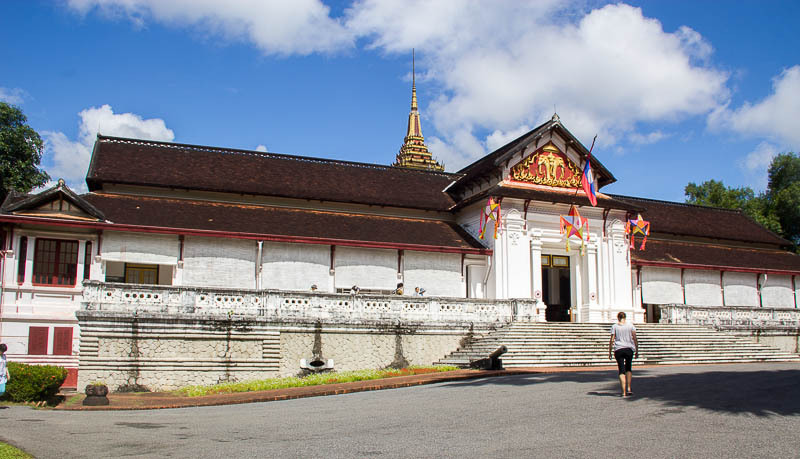 What remains now are exhibits of royal apartments, Throne Room, royal artefacts, religious objects, king’s collection of cars, the statue of King Sisavangvong and Haw Prabang Temple. 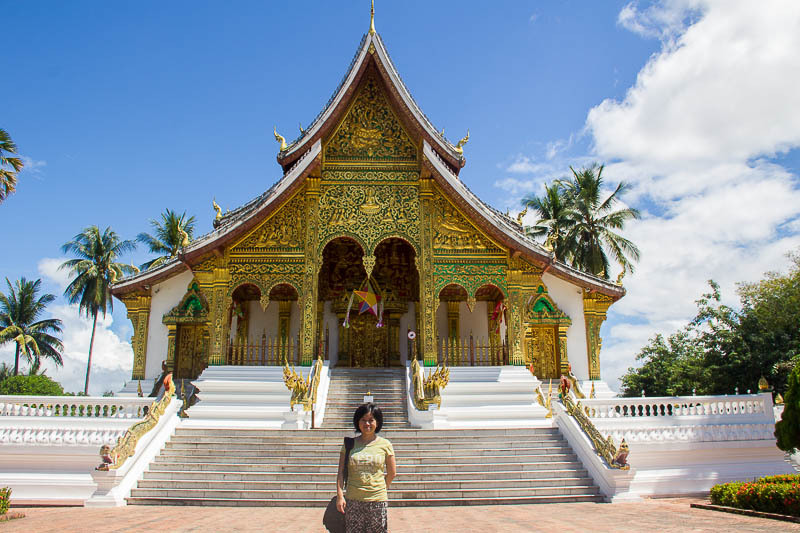 Haw Prabang Temple minus the crowd! 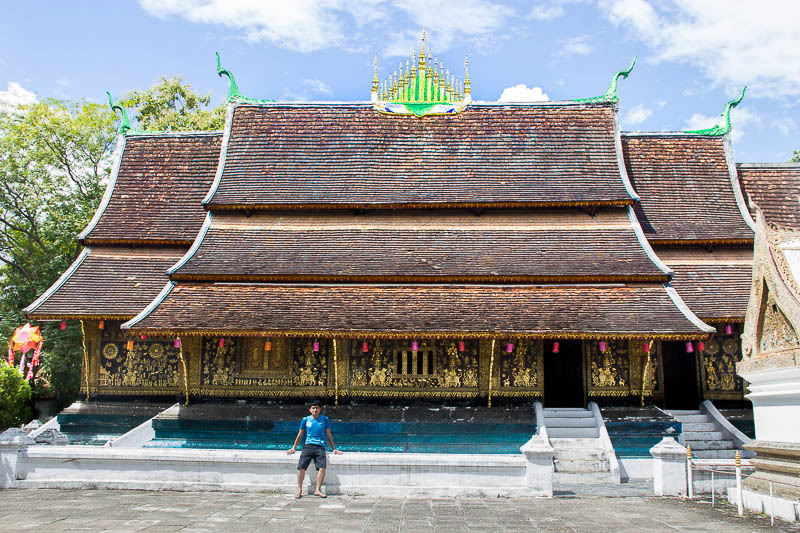 Another angle of Haw Prabang temple without tourists! 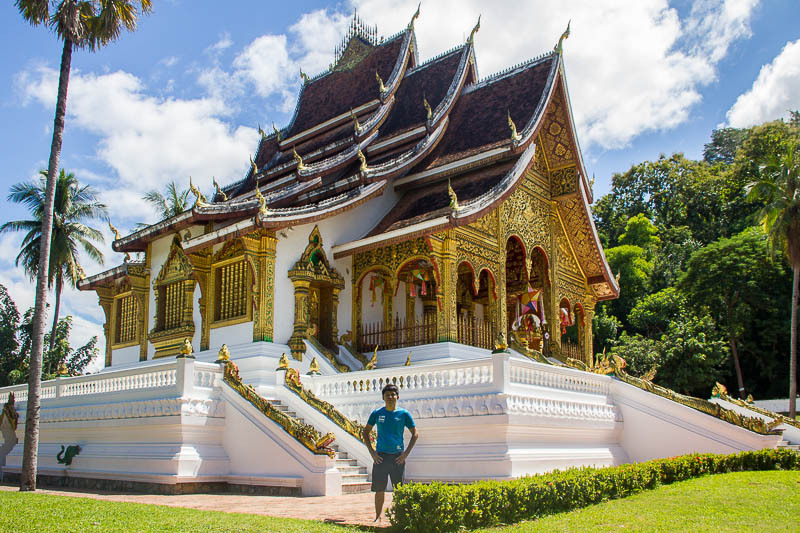 There are many temples in the town of Luang Prabang, but if you have limited time, I’d suggest you visit only Wat Xieng Thong. 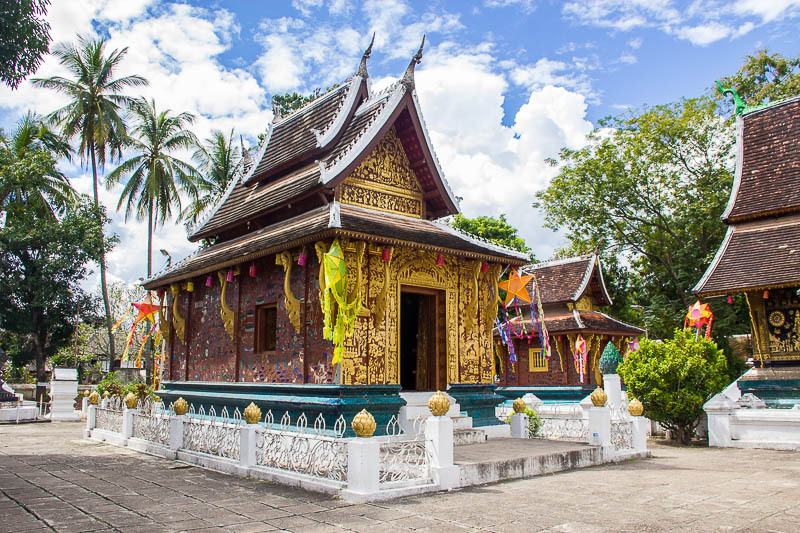 It is an important site in Luang Prabang which serves as the place for the coronation of Lao Kings, receiving notable visitors as well as gathering place for annual festivals such as Boun Lai Heua Fai (Festival of Light Boats). Tips: Allow 1 to 2 hours exploring this site, because there are so many picturesque spots in the compound. 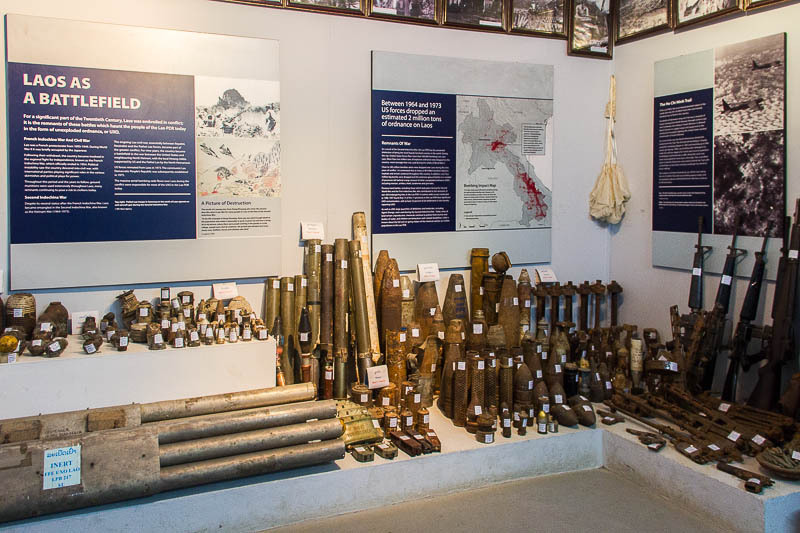 At the UXO (Unexploded Ordnance) Centre, we saw the inert explosives, watched the documentary about how UXO affected lives of Lao people and learned the history of UXO in Laos. What we learnt saddened us. 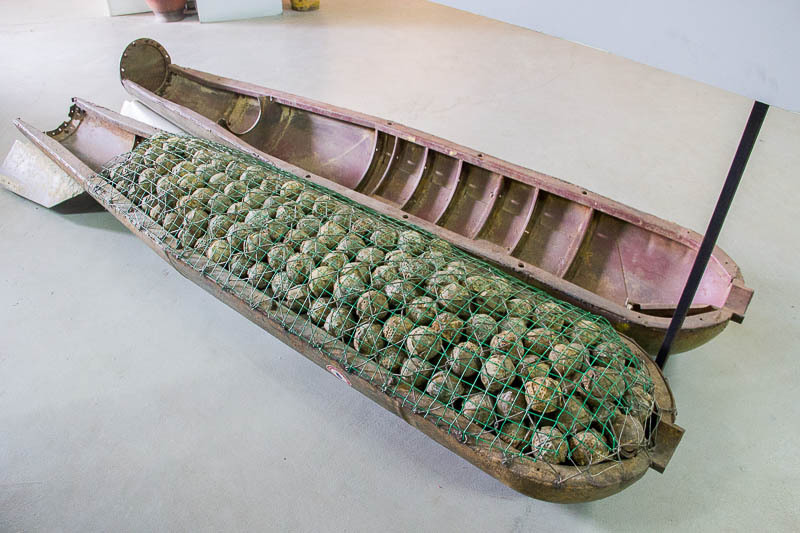 Between 1964 and 1973, during the Vietnam War, US Forces dropped an estimated 2 million tons of explosives in Laos. To date, a lot of the explosives are still alive and buried under the ground. Many children and adults were injured due to innocent digging, farming and mining activities. Now, the UXO Centre is actively clearing lands in Laos to make sure the lands are free from explosives and safe for farming. 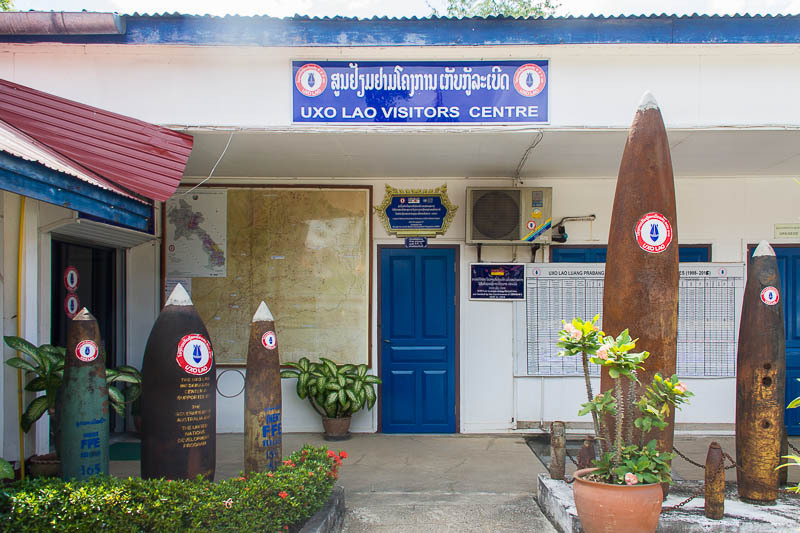 You can contribute any amount of money to help the mission of eradicating UXO in Laos. 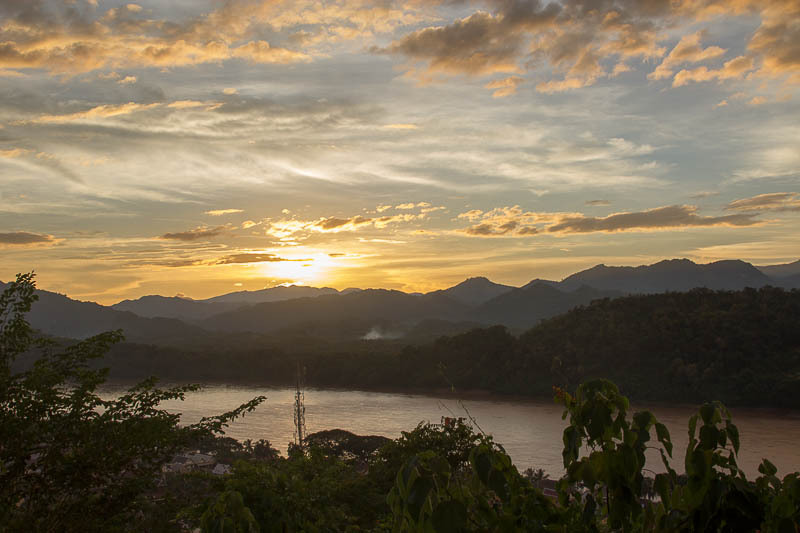 The best place to watch the sunset in Luang Prabang is undoubtedly Mount Phousi. To get to the top, you need to climb many steps. There are two entrances to the top of Mount Phousi: at opposite of Royal Palace Museum along Sisavangvong Road and at Kingkitsarath Road. Tips: Mount Phousi is so much more than just a sunset spot. Arrive early to explore more. People queue to take photo here. Eat to your heart’s content and shop til you drop! 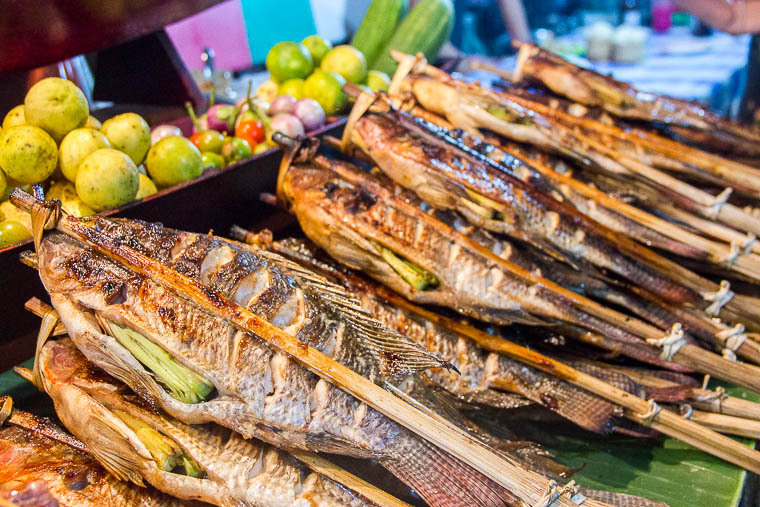 Here’s recommended food to feast on: grilled fish, noodle soup, buffet dishes, fried pork, coconut pancakes and beers! At the Morning Market, you are bound to find great stuff as well as weird stuffs. The great ones are the food, fruit, and snacks! The weird ones involve insects! Curious? 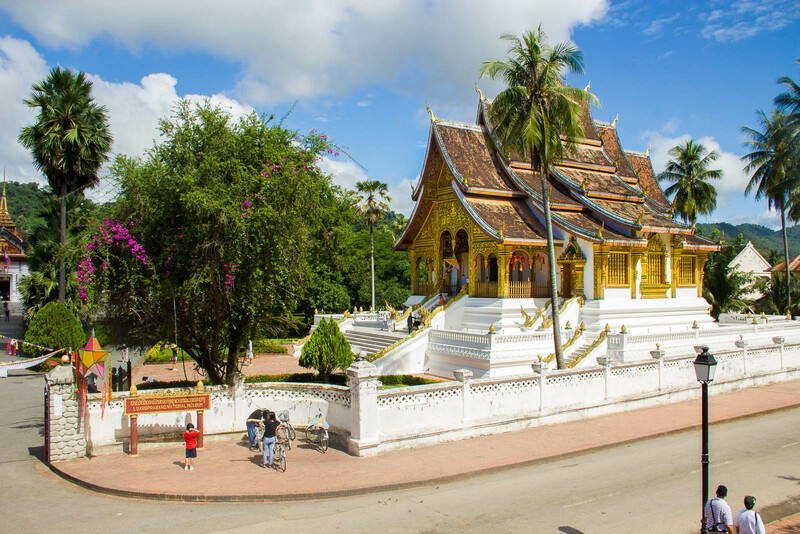 Read here: The Markets of Luang Prabang. 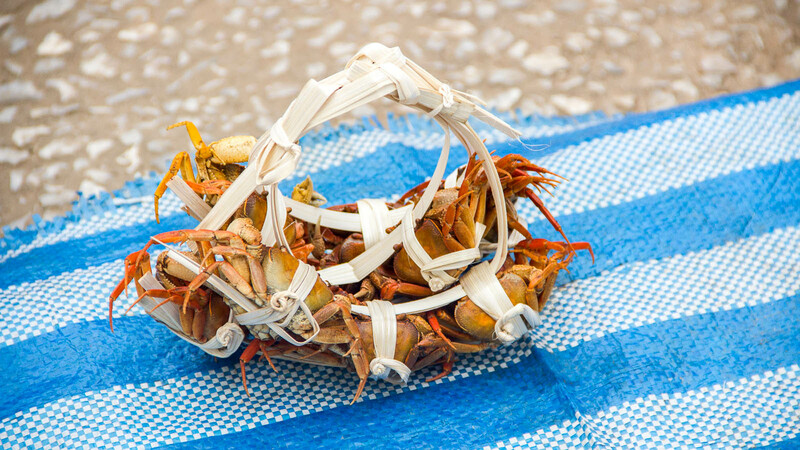 Interesting ay to carry crabs! 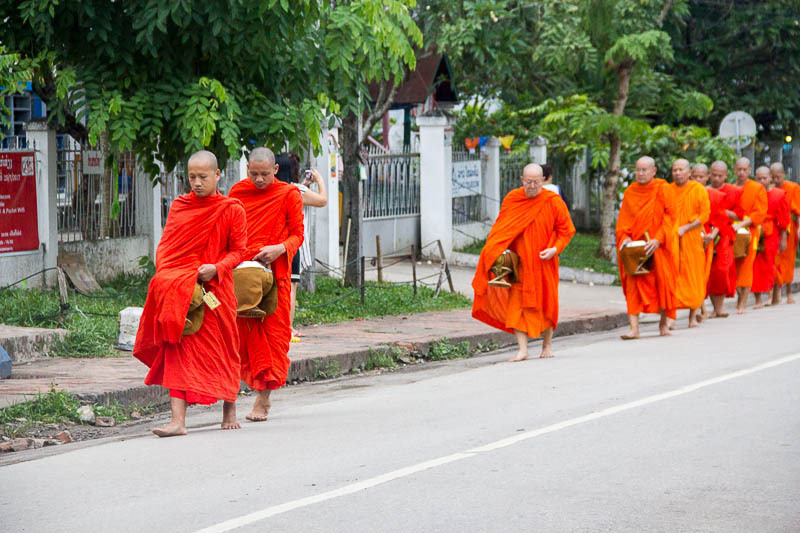 Every morning, alms giving ceremony takes place at sunrise at the main street. Personally, I would encourage travellers to witness, but NOT to participate, in alms giving ceremony. 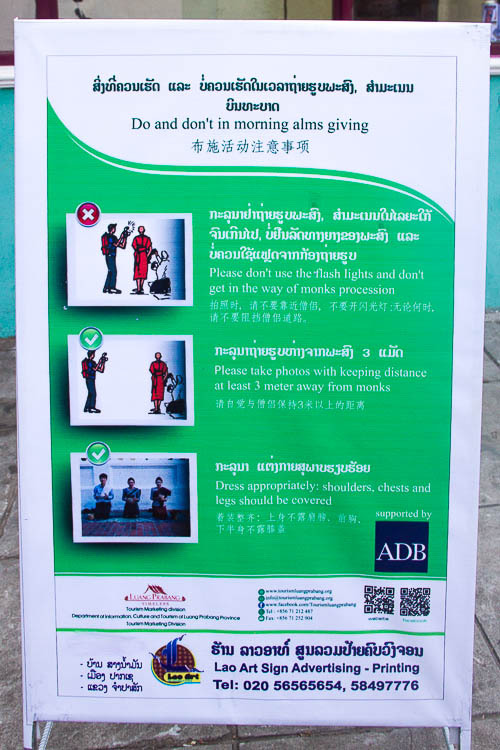 Here’s why: You might accidentally do something that’s disrespectful to the monks. 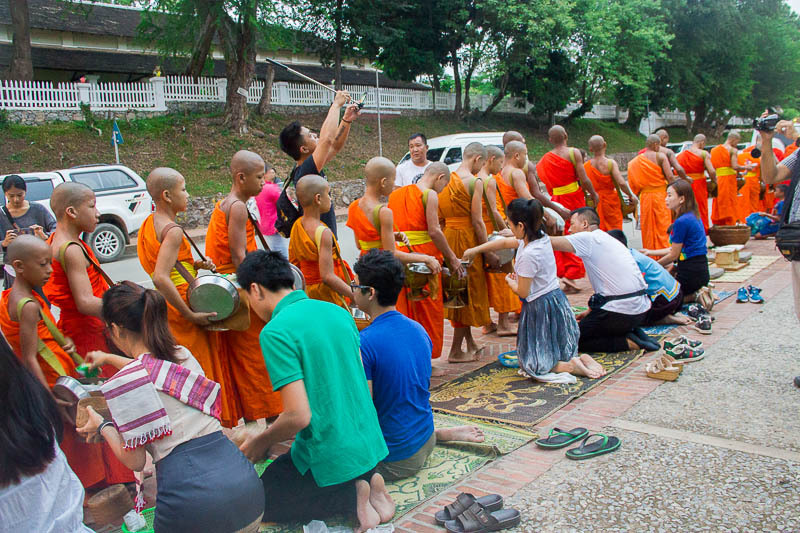 Alms giving ceremony is a sacred procession for Buddhists. As a Buddhist, I felt sad when I saw reckless travellers giving donations while wearing revealing clothes and irresponsible people who block the procession while taking photos of the monks. DON’T ever take photo like this guy! I’m a fan of crispy pork and I was so delighted to find this pho. 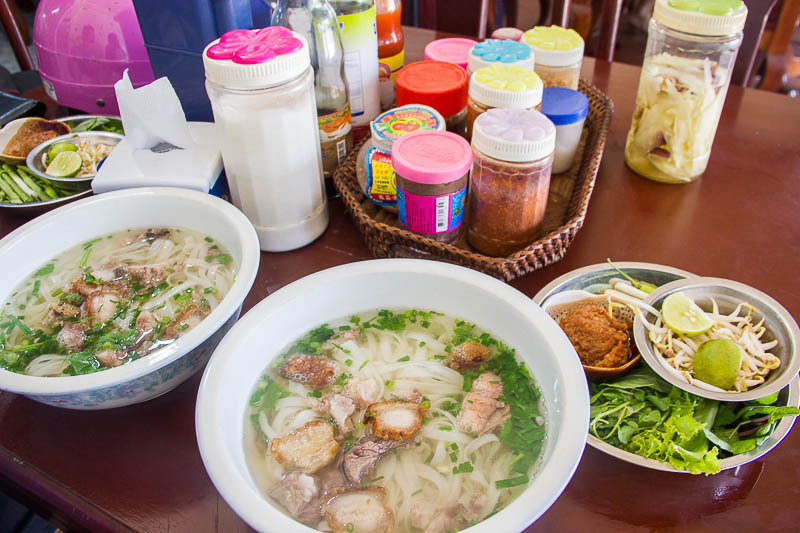 A huge bowl of pho with crispy pork only costs 20,000 kips. It’s so good we went twice. This shop is not within walking distance from the town of Luang Prabang so you can take a tuk-tuk to go there or rent a bicycle or motorbike. This is a café in Luang Prabang that you don’t want to miss. It has wonderful ambience and splendid food with affordable price. Their best-selling item was pho; and it was mind blowing, I had a second bowl! 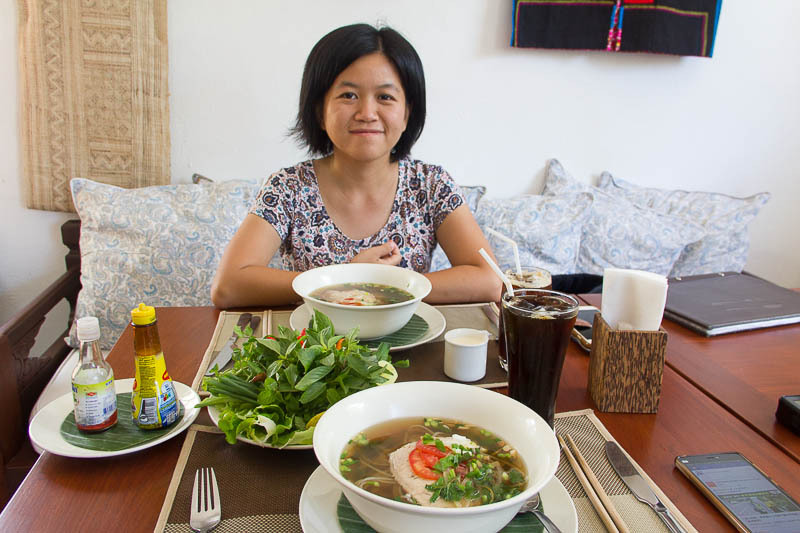 Read more about Our Favorite Food in Luang Prabang. 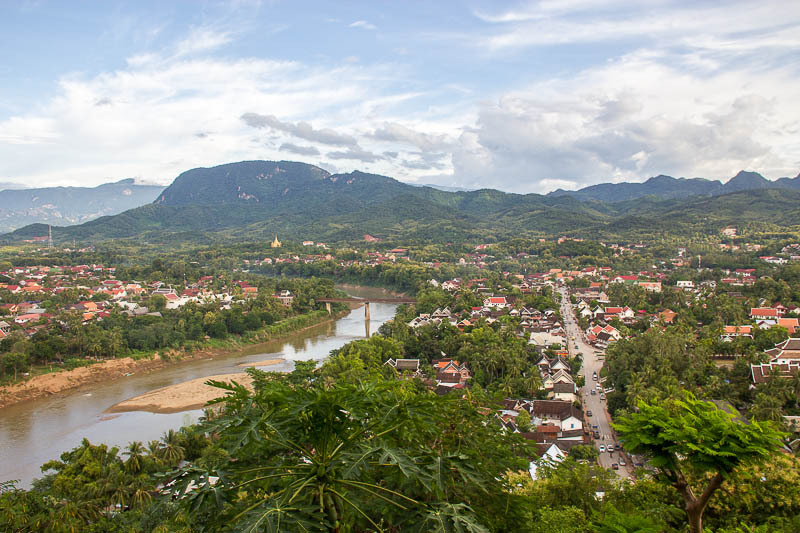 Even though the massage in Luang Prabang is not as cheap as in Thailand, it’s still a worthwhile splurge. A 60-minute massage at L’Hibiscus Spa costs 60,000 kips and we loved it. We also tried massage at Silver Naga; we paid the same price but didn’t like it at all. There are plenty of expensive spas in Luang Prabang as well. 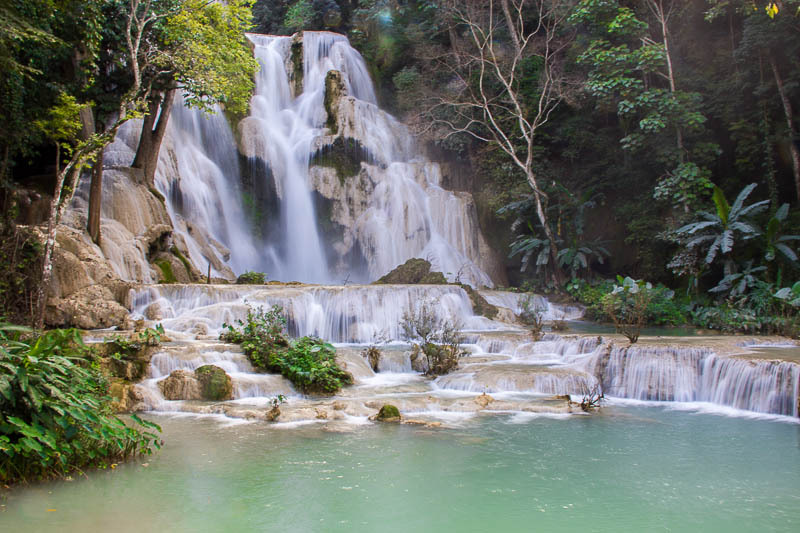 You MUST visit Kuang Si Waterfalls. It’s a heaven on earth. Here, you’ll find waterfalls after waterfalls, pools after pools. 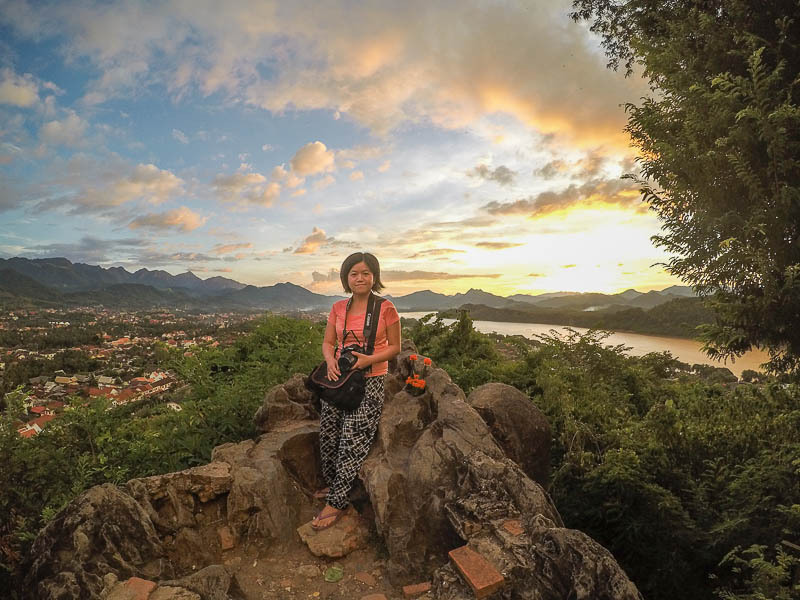 There are many ways to go to Kuang Si: tuk-tuk, car or motorbike. There’s a Bear Rescue Centre inside Kuang Si where endangered Asian black bears are protected. Tips: Climb up to the top of the Big Waterfall where you can find the Secret Pool that not many people visit. Read about my visit to Kuang Si Waterfalls. Visit Pak Ou Caves by taking the slow boat, enjoy the scenery and river breeze as you cruise along the Mekong river. The boat will have a stopover at Whiskey Village where you can sample free whiskey which has exotic reptiles inside the jar. At Pak Ou Caves, do note that there are 2 caves: Lower and Upper. Do not make the same mistake like us, we almost missed out the Upper Caves. Tips: bring a torch and selfie stick. Read about my visit to Pak Ou Caves.